Dany N'Guessan scored on his debut as Millwall progressed into the second round of the Carling Cup. The striker, on loan from Leicester, slotted home after racing on to John Marquis's flick. N'Guessan had a host of chances but he hit the post and twice had efforts saved by Plymouth keeper Jake Cole. The hosts struggled to create openings but nearly forced extra time at the death, only for Matt LeCointe to see his shot saved by Steve Mildenhall. 90:00+5:16 The referee brings the game to a close. 90:00+4:50 Ben Gibson gives away a free kick for an unfair challenge on Nadjim Abdou. Direct free kick taken by Hamer Bouazza. Correction - 90:00+2:28 Foul by Jordan Copp on Nadjim Abdou, free kick awarded. Steve Mildenhall takes the direct free kick. 89:46 Effort on goal by Chris Hackett from just inside the penalty area goes harmlessly over the target. 89:06 Matt Lecointe takes a shot. Save by Steve Mildenhall. 87:23 Effort on goal by Conor Hourihane from just outside the area goes harmlessly over the target. 83:38 Scott Barron takes the direct free kick. 83:38 Booking Booking for Simon Walton for unsporting behaviour. 83:34 Jordan Stewart fouled by Simon Walton, the ref awards a free kick. 82:45 Inswinging corner taken by Hamer Bouazza, Simon Walton makes a clearance. 81:06 Corner from the right by-line taken by Hamer Bouazza, Tony Craig has a headed effort at goal from close range which goes wide left of the target. 80:27 Effort on goal by Tamika Mkandawire from outside the box goes harmlessly over the bar. 78:30 Free kick awarded for a foul by Scott Barron on Luke Daley. Shot comes in from Robbie Williams from the free kick, comfortable save by Steve Mildenhall. 77:17 Substitution Hamer Bouazza is brought on as a substitute for Dany N'Guessan. 76:46 Jack Smith fouled by Jordan Copp, the ref awards a free kick. Tamika Mkandawire restarts play with the free kick. 75:37 Shot from outside the box by Chris Hackett misses to the left of the target. 72:47 Substitution Jordan Copp comes on in place of Ladjie Soukouna. 72:09 Dany N'Guessan takes a shot. Save by Jake Cole. 71:28 Darren Purse challenges Ben Gibson unfairly and gives away a free kick. Conor Hourihane restarts play with the free kick. 69:16 The ball is delivered by Jordan Stewart, Dany N'Guessan produces a header from close range which bounces off the post. Conor Hourihane challenges Tamika Mkandawire unfairly and gives away a free kick. Shot comes in from John Marquis from the free kick. 67:30 The offside flag is raised against John Marquis. Free kick taken by Simon Walton. 66:16 Corner taken left-footed by Robbie Williams, Foul by Stephane Zubar on Darren Purse, free kick awarded. Steve Mildenhall takes the direct free kick. 66:16 Substitution Tamika Mkandawire replaces Therry Racon. 62:21 Foul by Ladjie Soukouna on Dany N'Guessan, free kick awarded. John Marquis takes the free kick. 59:00 Jordan Stewart challenges Stephane Zubar unfairly and gives away a free kick. Direct free kick taken by Simon Walton. 54:59 Free kick awarded for a foul by John Marquis on Ladjie Soukouna. Jake Cole takes the indirect free kick. 54:37 Jordan Stewart takes a shot. Stephane Zubar gets a block in. 53:27 Corner taken left-footed by Chris Hackett from the left by-line, Ladjie Soukouna makes a clearance. 52:10 Substitution Matt Lecointe comes on in place of Jared Sims. 48:12 Jack Smith sends in a cross, Close range headed effort by Dany N'Guessan goes wide of the left-hand upright. 46:01 Corner taken right-footed by Chris Hackett. Darren Purse challenges Luke Daley unfairly and gives away a free kick. Jake Cole restarts play with the free kick. 45:00+3:42 The first half comes to an end. 45:00+1:41 Direct free kick taken by Scott Barron. 45:00+1:41 Booking Conor Hourihane is shown a yellow card for dissent. 45:00+1:19 Free kick awarded for an unfair challenge on Nadjim Abdou by Luke Daley. Correction - 44:58 John Marquis fouled by Ladjie Soukouna, the ref awards a free kick. Chris Hackett has a direct shot on goal from the free kick, blocked by Tom Hitchcock. 44:58 Ladjie Soukouna challenges John Marquis unfairly and gives away a free kick. Chris Hackett fires a strike on goal direct from the free kick, blocked by Tom Hitchcock. 44:43 The referee gives a free kick against Chris Hackett for handball. Free kick taken by Ben Gibson. 42:36 Jack Smith concedes a free kick for a foul on Ben Gibson. Simon Walton restarts play with the free kick. 41:58 Corner taken right-footed by Chris Hackett from the left by-line, save by Jake Cole. 41:14 The ball is swung over by Chris Hackett, Darren Purse takes a shot. Jake Cole makes a save. 41:14 Booking Ben Gibson is shown a yellow card for unsporting behaviour. 41:07 Chris Hackett fouled by Ben Gibson, the ref awards a free kick. 35:40 Luke Daley is ruled offside. Steve Mildenhall takes the free kick. 35:19 Foul by Darren Purse on Jared Sims, free kick awarded. Simon Walton takes the free kick. 33:02 Free kick awarded for an unfair challenge on Jared Sims by Scott Barron. Direct free kick taken by Simon Walton. 32:32 Robbie Williams takes a shot from long range which goes wide of the right-hand upright. 31:26 Robbie Williams fouled by Chris Hackett, the ref awards a free kick. Robbie Williams delivers the ball from the free kick left-footed from left channel, Darren Purse makes a clearance. 30:26 Unfair challenge on Ben Gibson by Nadjim Abdou results in a free kick. Simon Walton takes the direct free kick. 30:04 The referee blows for offside against Tom Hitchcock. Steve Mildenhall takes the indirect free kick. 28:56 The referee gives a free kick against John Marquis for handball. Ben Gibson takes the free kick. 28:06 Tony Craig challenges Tom Hitchcock unfairly and gives away a free kick. Free kick taken by Simon Walton. 27:22 The official flags Dany N'Guessan offside. Conor Hourihane restarts play with the free kick. 26:50 Shot from deep inside the area by Dany N'Guessan clears the crossbar. 26:01 Shot from just outside the box by Scott Barron goes over the bar. 24:16 The assistant referee flags for offside against John Marquis. Jake Cole takes the direct free kick. 22:57 Curtis Nelson takes the direct free kick. 22:57 Booking Nadjim Abdou is booked. 22:45 Free kick awarded for an unfair challenge on Conor Hourihane by Nadjim Abdou. 22:08 Free kick awarded for a foul by Tom Hitchcock on Scott Barron. Direct free kick taken by Scott Barron. 20:39 Outswinging corner taken right-footed by Chris Hackett played to the near post, Unfair challenge on Ben Gibson by Dany N'Guessan results in a free kick. Direct free kick taken by Jake Cole. 17:39 Shot from just outside the area by Tom Hitchcock misses to the right of the target. 17:19 Jared Sims fouled by Nadjim Abdou, the ref awards a free kick. Simon Walton takes the free kick. 15:31 Tony Craig restarts play with the free kick. 15:31 Booking Tom Hitchcock receives a yellow card for unsporting behaviour. 15:15 Free kick awarded for an unfair challenge on Darren Purse by Tom Hitchcock. 13:50 Assist on the goal came from John Marquis. 13:50 GOAL - Dany N'Guessan:Plymouth 0 - 1 Millwall Dany N'Guessan fires in a goal from inside the penalty box to the bottom left corner of the goal. 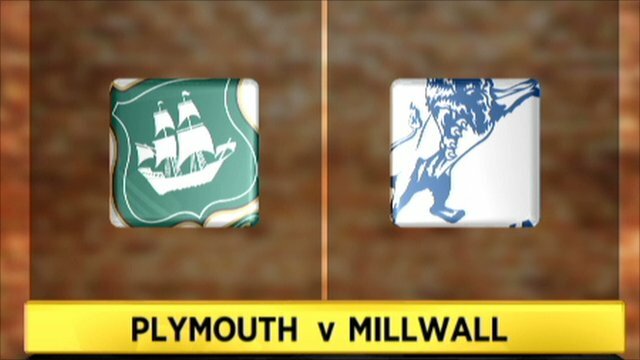 Plymouth 0-1 Millwall. 13:22 Therry Racon fouled by Stephane Zubar, the ref awards a free kick. Steve Mildenhall takes the free kick. 12:25 Corner taken short by Luke Daley. 12:14 The ball is crossed by Robbie Williams, clearance by Darren Purse. 11:46 Short corner taken by Luke Daley. 11:21 Ben Gibson takes a shot. Chris Hackett gets a block in. 10:03 Chris Hackett produces a drilled left-footed shot from 25 yards. Jake Cole makes a comfortable save. 8:51 Free kick awarded for an unfair challenge on Ladjie Soukouna by Dany N'Guessan. Jake Cole restarts play with the free kick. 7:13 John Marquis is ruled offside. Simon Walton takes the free kick. 3:05 Free kick awarded for a foul by John Marquis on Curtis Nelson. Simon Walton takes the free kick. 1:58 John Marquis is caught offside. Indirect free kick taken by Jake Cole. 1:12 Dany N'Guessan takes a shot. Save by Jake Cole.